• Marinate the chicken cuts with the sesame oil, soy sauce and some dashes of pepper for about an hour. • Heat up the olive oil in a deep pot on MEDIUM-HIGH fire. • Add in the garlic cloves and big onions. Saute thoroughly until caramelized. • Add in the cubed chicken meat and bay leaves. Saute until meat cook. • Add in the can of tomato puree, mixed herbs and chopped coriander stalks. Stir for about 5 minutes. • Add in the red tomatoes, carrot, broccoli, cauliflower and stir for another 10 minutes. 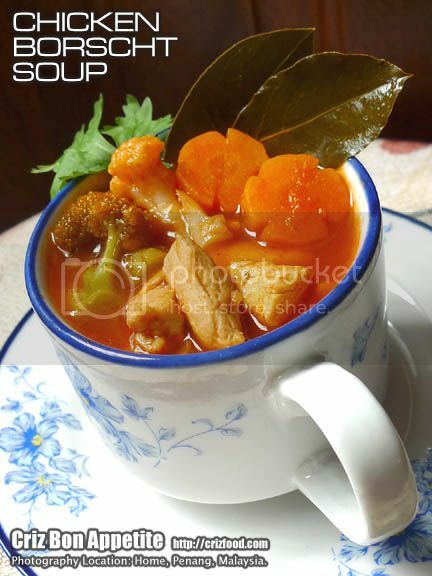 • Pour in 5 cans of chicken broth/stock (using back the same can as the tomato puree). Add more if you prefer the soup to be a bit more diluted but not advisable as the vegetables would emit some juices. Bring to boil. Note: If you do not have chicken broth/stock available, you can always use 5 cans of filtered water plus 4-5 tablespoon of Vegeta No MSG added, a multi-purpose seasoning. • Cabbages to be added in last. Let it cook for another 5-10 minutes or more until the cabbages are roughly softened. • Add in coarsely blended black pepper, salt (more Vegeta if using the seasoning) and sugar (about 1/2 – 3/4 tablespoon or minimal for a healthier lifestyle) to taste. • Serve hot or chilled with some parsley leaves as garnishing. Serving some toasted garlic bread would be nice too. This is perfect for dinner! I can’t wait to try this recipe. I’m sure my family will love this. Thanks for sharing. I love Borscht! The traditional Ukrainian version uses beets which colour the soup bright red. Very appetizing to eat. 😀 Love how you put soooo much vegetables in it too.